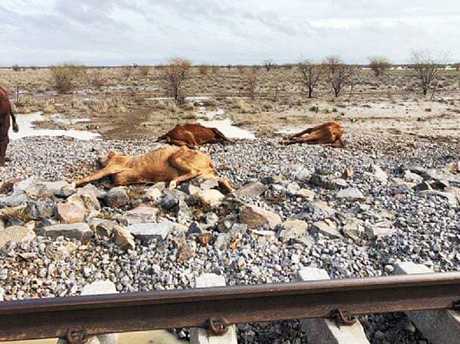 Some of the dead cows found at Eddington Station near Julia Creek. Farmers who managed to keep their cattle alive for seven years, through one of Australia's worst droughts in history, have watched their herds wiped out in a matter of days after unprecedented floods devastated much of Queensland. When the first rain started to fall in the state's west two weeks ago, drought-stricken farmers felt they could finally breathe a sigh of relief. It's been more than seven years since the region received a substantial downpour but the monsoon - which saw clouds dump three years worth of rain in 10 days - is expected to cripple farmers for decades. The sheer devastation has been labelled a national disaster and it's left desperate farmers - facing three years without any income - begging the government for help. "As we begin to access our paddocks we are being confronted with death and devastation at every turn. There are kangaroos dead in trees and fences, birds drowned in drifts of silt and debris and our beloved bovine family lay perished in piles where they have been huddling for protection and warmth," Ms Curley wrote. "This scene is mirrored across the entire region, it is absolutely soul destroying to think our animals suffered like this. "The rain and wind was so intense they piled on top of one another for warmth. Many of these were still alive but we had to shoot most of them. We lifted the live ones out with helicopters to try saving them, but only a few survived," Ms Curley captioned one of her heartbreaking pictures. "We just couldn't get the machines to get them out in time. The tears are rolling as I write this, I love these animals and can't bear to see them suffer unnecessarily," Jacqueline Curley wrote. 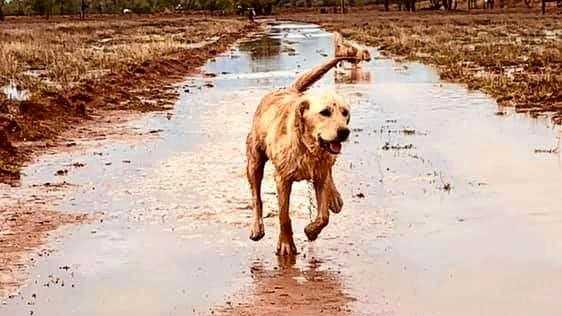 Grazier Nigel Simmons was celebrating the rain at the end of January - not realising the monsoon trough would continue for weeks. "The stock losses are going to be horrendous. My heart breaks from the number of deaths I have seen within walking distance of the house," Mr Simmons wrote on Facebook. "It sickens me to think what I will find further afield when I can get around. My cattle are my life, my passion...to all the people in the same boat as us, there will be tears, there will be break downs, there will be so much pain. But we will get up, we will carry on, we will come out the other side of this, and we will have an excellent grass season for the surviving livestock." 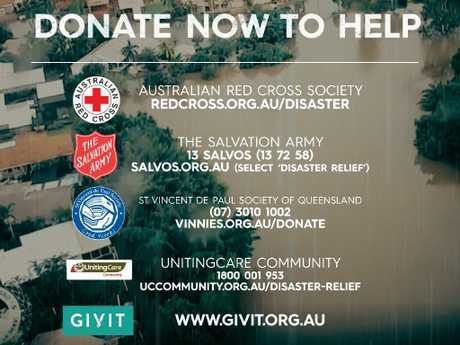 Speaking at the National Press Club earlier today, Prime Minister Scott Morrison announced an immediate non-gratia $1 million for shires inundated by floods. "This payment will be for them to use on priorities they deem most urgent - whether that be rate relief for impacted properties, infrastructure, or the disposal of cattle which have perished," he said. Sarah Macartney, a farmer from the regional town of Mount Isa, captured a snippet of the devastation from her helicopter on Saturday as she filmed dozens of dead cows lying on the flooded ground. Jane McMillan, another grazier from rural Queensland, has been on the ground trying to help others understand the true extent of what farmers are facing. Most graziers in rural Queensland are facing zero income for the next few years as they work from the ground up. 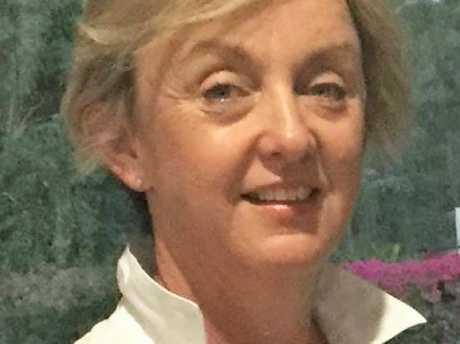 Ms McMillan has a cattle farm in Cloncurry, a tiny town near the Northern Territory and Queensland border, and is looking at at least 50 per cent losses. "We don't know what's going to happen next … people have lost their income for the next three years. We can't pay the banks back. We need Australia to back us," Ms McMillan said on Facebook. "It is really bad," she later told Channel 7. "We need to support our own. We need to walk out a system where we support our own first and then we look at foreign aid." Rural properties are still underwater and graziers continue to search for their surviving cattle in order to feed them. 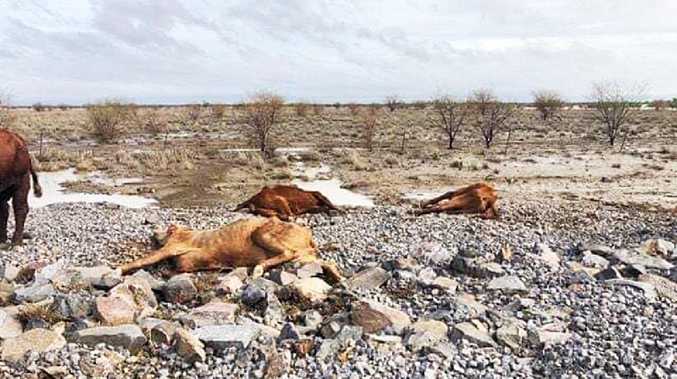 "First off the cattle are either drowning, then if they're not drowning then a few days ago we had a massive wind, a 50 to 60km/h wind with cloud cover which dropped the temperature down to 19C. So if they didn't drown, they froze from the elements because of the rain," Ms McMillan said. "So some places didn't have all the rain but they had these conditions of wind and rain … It's so traumatic for the people there flying those helicopters … there's some men out there that haven't slept for six days, there's no bullets left." The army is helping out with food drops and clean-ups but the heavy stock losses are taking their toll. "For years now, we have neglected rural and remote Australia and we spent thousands of dollars on the east coast in our major cities on hospitals and schools and roads and rail, but (not) in outback Australia," Ms McMillan said. Cloncurry grazier Jane McMillan says hundreds of thousands of cattle have been lost. 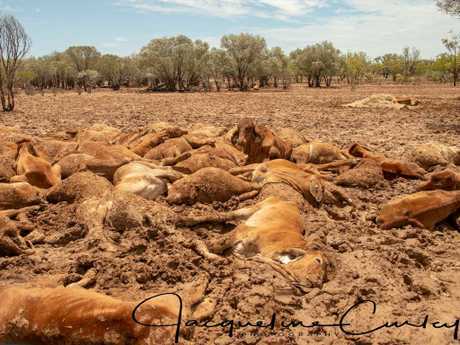 Rae Stretton posted these horrifying images of dead cattle from floodwaters in Eddington Station near Julia Creek. 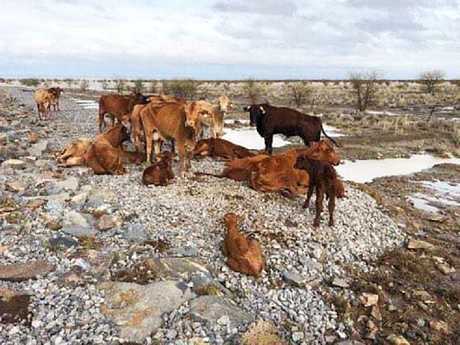 Starving cattle that escaped floods near Julia Creek. Another Cloncurry farmer got in touch with the 2GB host to explain their week of horrors. "Our cattle became weak using what energy they had struggling through the mud and pushed by the driving rain … they finally became exhausted simply trying to stay warm," the farmer wrote. "Other properties have had their entire herds washed away. More than 100,000 cattle gone. "Some paddocks are facing 95 per cent losses. "Australia - we need your support. You can help us by using your consumer power and insisting on buying local produce. Then we can continue to provide your families with our top quality, homegrown, nourishing beef." The two-week long deluge continues to dump rain in the state's west as farmers continue to call on the federal government for more financial support. As of Sunday, insurers had received 13,560 claims, with losses estimated at $165 million. Federal MP Bob Katter said he would call on Prime Minister Scott Morrison to take urgent action when he is in Canberra later this week. "You've got the mother of all disasters for the northern beef industry," Mr Katter told the Townsville Bulletin. The devastation brought Queensland's Fire and Emergency Services chief Katarina Carroll to tears last week when she was asked to compare the floods and Cyclone Debbie. Ms Carroll has been on the ground since far north Queensland started to be hit with monsoon rains in late January. "Cyclone Debbie … I think it has been mentioned a number of times … Debbie. I think everyone in this community has never in their lifetime seen anything like this," Ms Carroll said, her voice breaking as she spoke. "From the fires that we experienced at the end of November, just the end of November to the first week of December, never in the history of this state have we seen anything like this. "We were with the Premier and the state disaster co-ordinator out in Cloncurry yesterday, when you see the devastation of the cattle on the ground, it is confronting." "When you see what is happening here, it is confronting. "So, please, I think when you have the conversation out there with the communities you have really got to know that in my lifetime I have never seen anything like this."